7 kilos, if you stick to the the diet plan and menu. If you had trouble with calories or found calory counting too complicated, you don't need to worry anymore. 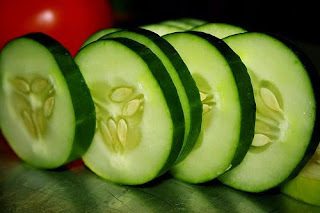 The cucumber diet is conceived on a very simple menu which puts an accent on the consumation of cucumber mainly. you need to eat 15 kilos of this vegetable. The cucumber diet is held around 10 days, but you can extend it up to two weeks. During the implementation of the diet, one can loose up to 7 kilograms if regular physical activities are added to the diet, and depending on how much exces weight is in question. It isn't recommended to do the diet beyond the regulated time period, because any day past the two weeks can affect your health in a negative way. REMARK: If you ever feel hungry you can always make yourself a cucumber salad. Try to take in more liquid during the diet and before attending this diet consult with your doctor. Peel the cucumber and afterwards cut it into little slices. Season it with some salt and mix it up with your hands. After you prepared the cucumber, pour yogurt, sour milk or kephir on it and mix it all up again. And if you like you can add some garlic to the salad. This diet like any other weight loss diet can have positive results in loosing weight, only if you loose your bad eating habbits and start doing some physical activities along the diet. The kilos won't dissapear all by themselves, when we talk about a very restrictive diet like this one. Every day walks which should last for 30 minutes at least, bicycle rides, easy exercises, enough liquid intake are the key things to your success. The cucumber diet demands that every participant pays attention to the quality of groceries they use in the diet- season fruits are best to be eaten, always freshly made. Our recommendation is that during the implementation of the diet, participants should drink sassy water, which has proved itself as a good method of aid in the battle against excess kilograms. Do not elongate this diet above the regulated time period of 14 days.